Charleston Concierge 3 Bedroom / 2 Full Bath Walk To Upper King Street! Tucked in between historical Charleston and the new WestEdge area, this newly constructed three bedroom, three story home contains all of the charm of Charleston with all the modern conveniences that will make your stay enjoyable. Two large front porches await you for having morning coffee/afternoon cocktails and enjoying the steady breeze off the Ashley River. 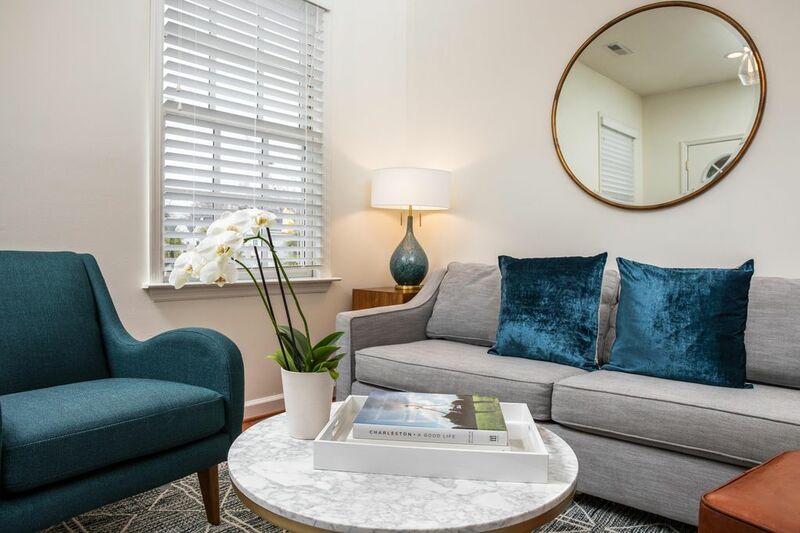 Our home has two garage protected spaces and ample on-street parking, and thats a luxury in downtown Charleston; however guests won't need their car much in our lovely city as our home is walking distance to most desirable attractions. Many are located just a 5-10 minute walk from our home..Joe Riley Baseball Stadium (catch a game played by our local team the Riverdogs), Brittlebank Park (the venue for many popular events including our ever exciting Southeastern Wildlife Festival), a marina on the Ashley River where you can charter boat trips. Walk to Spring & King Streets for restaurants and boutiques and many shopping choices. Right near our home is Purlieu, a fantastic neighborhood bistro (reservations recommended), Nana's Seafood & Soul, down-home Gullah-Geechie Cuisine, Modern Mexican-inspired Semillla, and Harold's Cabin (you may run into Bill Murray) for coffee, dinner or brunch and a rooftop garden. Foodies will be in heaven! A brand new Publix is within walking distance. Our home has three stories. The first floor features a living room with pullout sofa, fully equipped kitchen with all new appliances and marble counter tops which opens up to the dining area. Two large french doors open up to a large porch. There is one bedroom on the first floor with a queen bed, luxury linens and private full bath. The second floor has the second and third bedrooms. Bedroom #2 features a queen bed, luxury linens and its own private porch. This bedroom shares the full hall bathroom with bedroom #3. Bedroom #3 features a single twin bed. Our home sleeps 5 guests in beds and 2 on our pullout sofa. Everything in our home is fresh and new and waiting for you to enjoy with your friends and family. There is no better location to enjoy all that Charleston has to offer than on the West Side! "As part of Charleston's West Side, WestEdge is a new extension of a thriving, established community of beloved parks, athletic fields, schools, stadiums hotel and award-winning research hospitals and universities. Surrounded by the Medical University of South Carolina, Roper St. Francis Healthcare, the College of Charleston, and The Citadel, WestEdge is the next generation of research and discovery districts-driven by a desire to be ever more livable, ever more accessible, and ever more connected. The plan includes design and public access elements that create a walkable, healthy ambiance for the community. A bright, active main street forms the heart of the district, with a Public Super Market, shops, restaurants, and outdoor cafes. And a network of pedestrian, bike and auto cross connections will link the peninsula's greater West Side community to the waterfront at Brittlebank Park. Valid picture ID required with reservation. 30 Day Written Cancellation Policy. No refunds within 30 days of check in date. No smoking. Two night minimum. On weekends, Friday & Saturday night stay required. Property Management Company and / or Owner not responsible for parking tickets. All deposits, payments and / or monies paid are non-refundable within 30 days of your arrival date. Please be advised that we are a non-smoking property and any guests in violation of this under the Terms of our Listing and / or Short Term Rental Agreement, will void their CSA insurance policy and therefore be personally responsible for any damages. If a Mandatory Evacuation Order for Charleston County is given during the dates of your stay, management shall refund 100% of all deposits, payments and / or monies paid by the traveler within 72 hours. Owner or Property Management Company shall have no further liability with respect to the Reservation. Please note that if there is inclement weather in the other 49 states, prohibiting the traveler (or guests in traveler’s group) from getting to Charleston, a refund will not be issued and, Owner or Property Management Company shall have no liability with respect to the Reservation. During months where there is a potential for inclement weather, such as hurricane season, we strongly suggest travelers obtain insurance. SHORT TERM RENTAL OPERATIONAL PERMIT APPLIED FOR Beautiful 3 bedroom home, just a very short walk to all the happening places on and around Upper King Street! Perfect set-up for privacy either for families or couples. SHORT TERM RENTAL OPERATIONAL PERMIT APPLIED FOR Concierge services included but not limited to dining recommendations, reservations, event tickets, private chefs, airport transportation, fishing charters, boat cruises, baby equipment rentals, professional photography, child care and grocery delivery. Walk to all the happening places on Cannon, Spring and Upper King Street!